All of Moglea's hand-painted products are created by our staff in our Audubon, Iowa studio. Our watercolor cards and notebook covers are painted in large sheets of 4-ply mat board and recycled chipboard before being trimmed down to final size. A custom blend of dye is mixed to create the perfect hue for our dip dye cards. 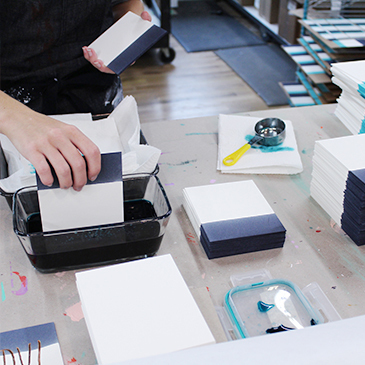 We dip each of our 4-ply mat board cards by hand before they are letterpressed. Most everything we create is designed and printed in our Audubon, Iowa studio. We print on one Chandler & Price platen letterpress, one Kluge Automatic foil stamping press and two Heidelberg Windmill letterpresses that were all built in the 1900's. 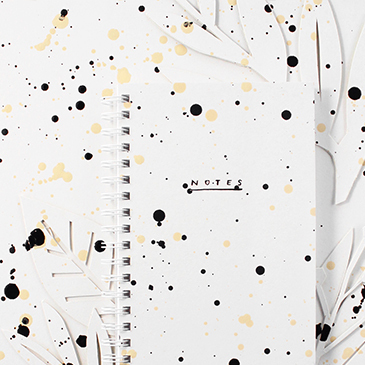 We cut, punch, and bind all of Moglea's sketchbooks and jotters in our own studio. The covers are hand-painted and foil-stamped on our Kluge. Holes are punched in high quality paper and bound by our production team. 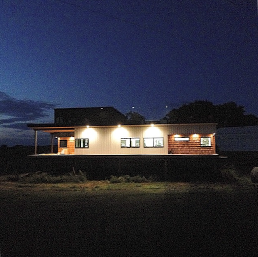 Moglea's studio was designed and built by Chad Gleason on their farm in Audubon, Iowa. The studio space opened in February of 2015 and now houses all of Moglea's in-house finishing production. Moglea launched in 2012 in the farmhouse of Chad and Meg Gleason. 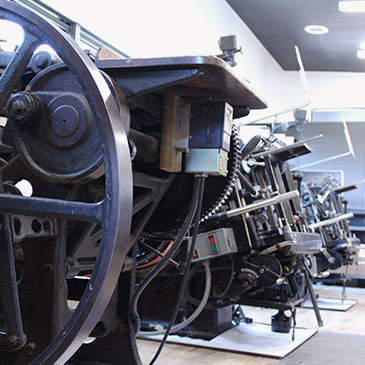 As the business grew, the space was quickly outgrown with addition of new presses and staff. Chad started designing the new studio in 2013 in anticipation that Moglea would certainly outgrow its home. 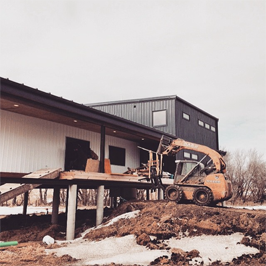 In 2014, Chad started construction on the studio with the help of friends, family and local contractors. The bottom level houses a letterpress studio and woodshop while the upper level has a shared kitchen and living quarters for short-term employees. 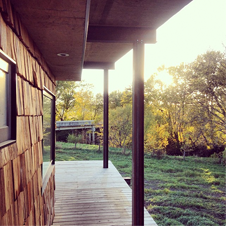 The studio was built next to the Nishnabotna River that runs adjacent to the farm and stands high off the ground to protect the space from potential flooding. 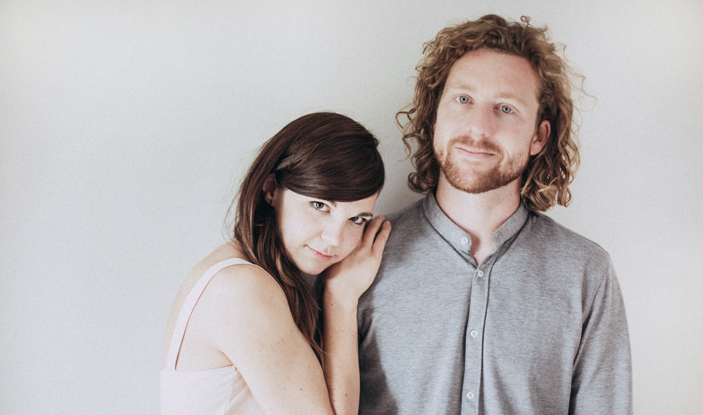 Moglea is under the creative direction of Chad & Meg Gleason. 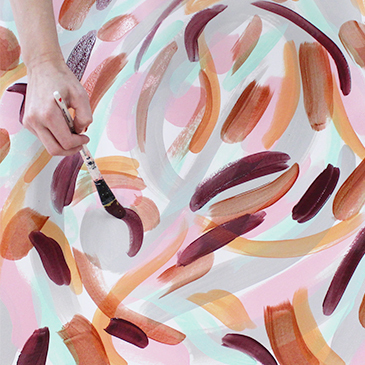 Meg, the illustrator behind the stationery line, loves gestural brush strokes and intricate geometric patterns. Chad, the designer behind the furniture and home accessory line, loves pairing modern design with artistic finishes. They are deeply inspired by their rural Iowa surroundings and the farm where they reside with their two children. for more information on current openings.